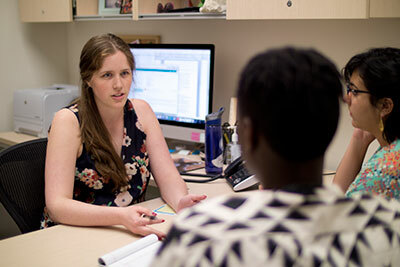 The primary goal of our graduate program is to provide highly qualified applicants a broad range of coursework, research experience, and practical training that will equip them to make independent contributions to psychology. *Graduates earn both M.A. and Ph.D. in the area of psychology of their choice, we do not offer a terminal Masters. We also have a program in human motivation that cuts across the clinical and social areas. We offer specialized training in developmental psychopathology through our clinical and developmental degree programs, as well as training in advanced quantitative methods. Two additional research units are affiliated with the department: the Mt. Hope Family Center and the Children's Institute. The Mt. Hope Family Center provides opportunities for training and research in developmental psychopathology. The Children's Institute provides similar opportunities for work on the detection and prevention of young children's adjustment problems. We encourage students to have broad interests, including ones that cross several areas or departments. We maintain strong ties with other biological and social disciplines across the University, including academic units in the University's Medical Center, Arts, Sciences and Engineering, and the Graduate School of Education and Human Development. To excel in any discipline, students need outstanding facilities, distinguished faculty, and an environment promoting their full integration in the research endeavor. Our department combines all these characteristics.